You can use the SQL Gateway to configure a TDS (SQL Server) remoting service for the CData ODBC Driver for Couchbase and set up a linked server for Couchbase data. After you have started the service, you can use the UI in SQL Server Management Studio or call stored procedures to create the linked server. You can then work with Couchbase data just as you would a linked SQL Server instance. To connect using the Login method, set User, Password, and Server to the credentials for the account and the address of the server you want to connect to. See the SQL Gateway Overview for a guide to configure a TDS remoting service in the SQL Gateway UI. The TDS remoting service is a daemon process that listens for TDS requests from clients. Provider: Select the SQL Server Native Client Provider that corresponds to your version of SQL Server. For example, SQL Server Native Client 11.0. Data Source: Enter the host and port the TDS remoting service is running on, separated by a comma. Note that a value of "localhost" in this input refers to the machine where SQL Server is running so be careful when creating a linked server in Management Studio when not running on the same machine as SQL Server. Catalog: Enter the CData system DSN, CData Couchbase Sys. In the Security section, select the option to have the connection "made using this security context" and enter the username and password of a user you created in the Users tab of the SQL Gateway. server: The linked server name. provider: Enter "SQLNCLI" for the SQL Server Native Client Provider. datasrc: The host and port the service is running on, separated by a comma. Note that a value of "localhost" in the datasrc input refers to the machine where SQL Server is running, so be careful when creating a linked server in Management Studio when not running on the same machine as SQL Server. catalog: Enter the system DSN configured for the service. srvproduct: Enter the product name of the data source; this can be an arbitrary value, such as "CData SQL Gateway" or an empty string. 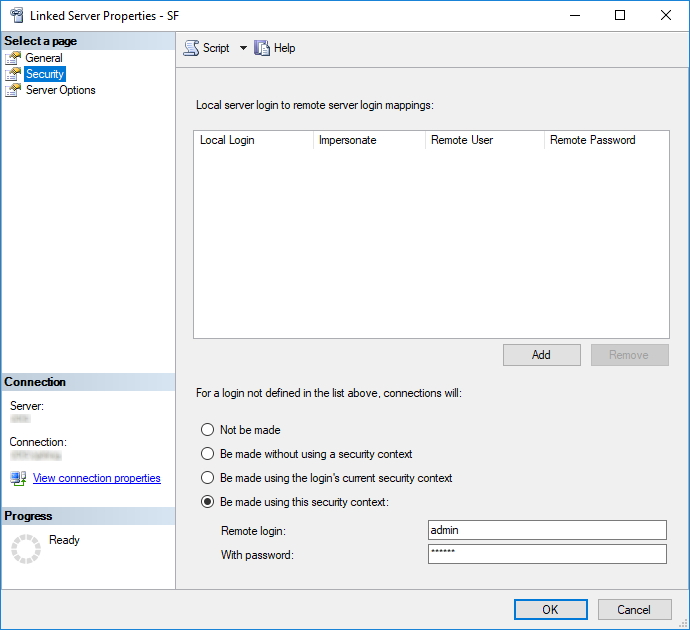 Call the sp_addlinkedsrvlogin stored procedure to allow SQL Server users to connect with the credentials of an authorized user of the service. Note that the credentials you use to connect to the service must specify a user you configured on the Users tab of the SQL Gateway. 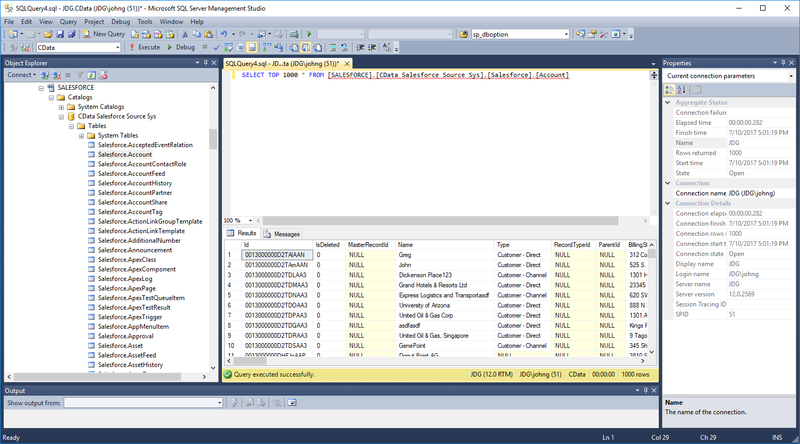 SQL Server Management Studio uses the SQL Server Client OLE DB provider, which requires the ODBC driver to be used inprocess. 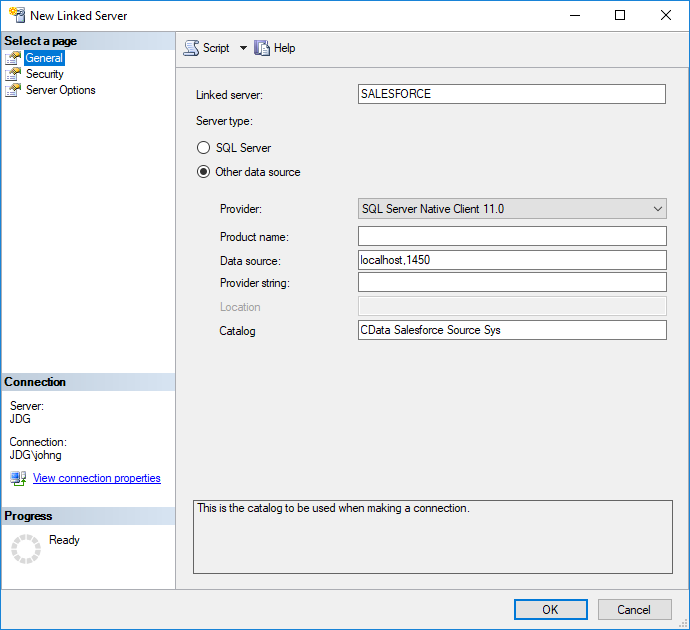 You must enable the "Allow inprocess" option for the SQL Server Native Client Provider in Management Studio to query the linked server from SQL Server Management Studio. To do this, open the properties for the provider you are using under Server Objects -> Linked Servers -> Providers. Check the "Allow inprocess" option and save the changes.